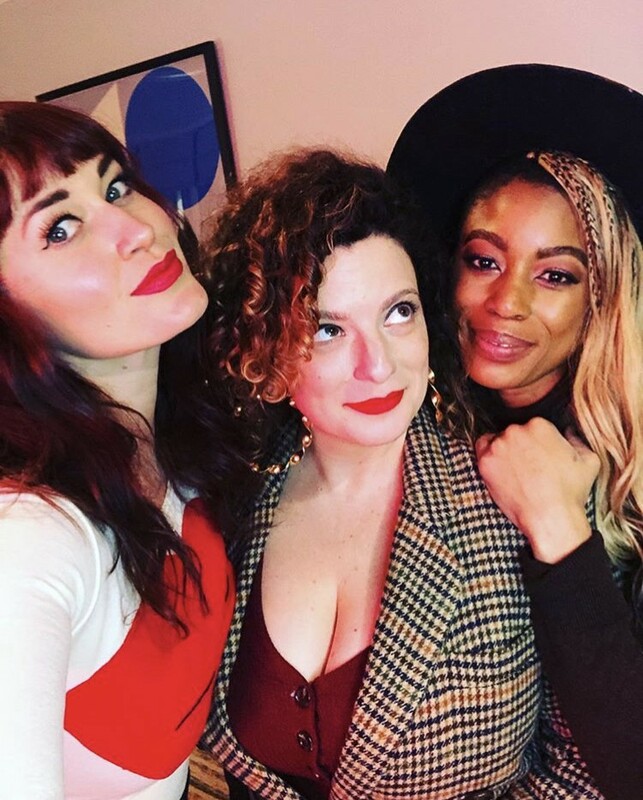 Hey look, it’s me and two of my faves, author/actress Mamrie Hart and hair and makeup artist Val Harvey, celebrating women without leaving Mamrie’s house! Celebrate Women Without Leaving The House! Artists can’t survive on talent alone. So check out the site Indiebound (like Amazon but for indepedent bookshops) and order a book by a lady person. Then read it and if you love it, write a great review on the book’s Amazon page (helps to get books more attention.) Ditto with Audible. Use Goodreads and write honest, positive reviews for great books by talented women. Look for women filmmakers and women who advocate for women filmmakers (Alma Ha’rel is both! Visit her project Free the Bid to learn more about how to support gals in TV, film and video.) Buy music by women, especially independent artists. Support gals on the filmmaking site Seed and Spark. While social media likes and compliments may feed the ego, they lack nutritional value and do not keep the lights on. Your favorite vlogger needs to eat, too. So if your Instagram fave puts up wacky chalk art, makes hilarious memes or writes little poems that inspire you, support her virtual tip jar (generally listed in her bio), Kickstarter project or Patreon account. Does she sell merchandise? Buy some! Personally, I like to tip the hilarious Not All Geminis now and again because she cracks me up. I’ve got a Patreon account to help fund my podcast and my wacky Instagram art project Excellent Coats On Irritated Women. And my friend Heather Fink and I made a feminist short film years ago thanks to over 500 Kickstarter supporters. We both have day jobs and night jobs and side gigs but the generosity of people who believed in our art helped us make a thing. 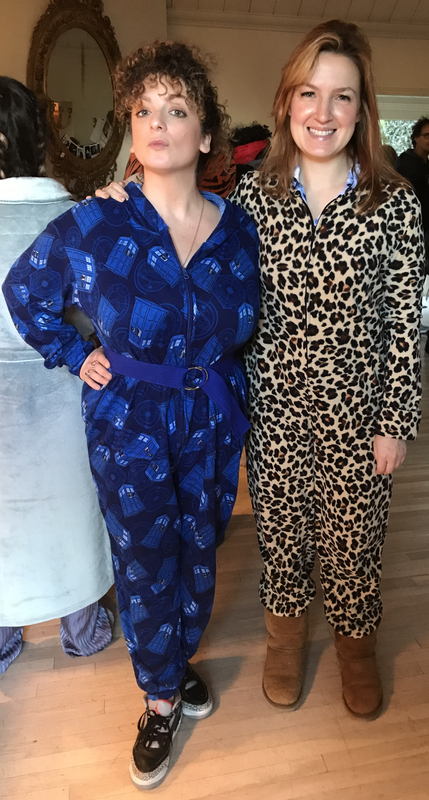 Here we are this year at a pajama party! Your support could help an artist buy pajamas! They’re not Internet artists per se, but I also support the trans-inclusive, queer coffee shop Cuties LA via their Patreon for $5 a month. They create a great atmsophere for folks of all backgrounds and interests, the food is good, the coffee is good, and they provide space for all kinds of programming. And as a subscriber, I support the lady-owned political site Wonkette, for whom (full disclosure) I’ve written on and off since about 2010 for $10 a month. Check out great craftswomen on Etsy and the awesome stuff on Witchsy. I’ve never actually been to the Women’s Center for Creative Work in Los Angeles, but I know for a fact they put on amazing workshops, so I joined. Whether or not you use the benefits you may get from supporting a Kickstarter, Patreon, vitual tip jar or subscription service, you can feel good knowing you’re helping somebody else put cool stuff into the world. Does your local community college have a women’s swim team that could use a donation or a new Instagram follower cheering them on? Is a woman in your community raising funds to run a charity race? Check out GoFundMe and other sites to see how you can help an athlete who may not have the prowess and fanbase of the great Serena Williams. Many of our nation’s homeless women are veterans. Many of our hungry children are girls. Many of our abused, endangered women are trans. Many of our refugees are mothers and daughters, sisters and aunts, grandmas and extraordinary single women. And that’s just the women in need in the USA. There are too many wonderful nonprofits to list, so first I recommend you check out Charity Navigator if you have any questions about a large nonprofit. Now I’ll list some charities I’ve supported in the past few years, because I believe in what they do. But be sure to look close to home for domestic violence shelters and comprehensive reproductive service providers in your area. The Delores Project — “The Delores Project provides safe, comfortable shelter and personalized services for unaccompanied women and transgender individuals experiencing homelessness. We also work to end homelessness by advocating for housing solutions.” They just opened Arroyo Village, a gorgeous housing center in Denver! Thanks to the Excellent Coats On Irritated Women community for telling me about MSP last year! My Sister’s Place — “My Sister’s Place (MSP) seeks to end domestic violence and empower survivors to live healthy, independent lives free from violence.” Serving Washington, D.C. since 1979. Thanks to the Excellent Coats On Irritated Women community for telling me about MSP last year! Los Angeles LGBT Center — The nation’s oldest, largest continually running LGBT center also includes an alternative high school program, workshops, eldercare resources, health services, and more. Miry’s List — This amazing woman-led organization provides all the supplies newly resettled refugees in Southern California need to get a healthy start in their new lives. UNHCR — The United Nations High Commission on Refugees does incredible stuff. War and natural disasters disproportionately affect women and children. Thanks to Neil Gaiman for doing a cheesecake-themed fundraiser for the organization with me recently — and rest assured you can still donate! So far we’re at $112,000 and counting. Plus, he and I are cooking up a very fun (if belated — sorry, we got really busy!) reward video for the masses that will hopefully bring in even more money for refugees. I know there are a bazillion more ways to support and celebrate women and girls. One is simply treating them with kindness and giving them space. Here’s a primer I wrote in September 2018 on How To Handle Lady Anger, and here’s one I wrote in October 2016 about How To Treat A Lady On The Internet. Now have a great day, whether indoor or outdoors or on your home planet, and do something great for a lady today!